Twenty family members and close friends gathered together, prayed together, ate together, and then laid around on the couch wishing for yoga pants. We were joined by five others for dessert. It was a spectacular day and evening where we enjoyed full bellies and fuller hearts. Oh and that win by my Washington Redskins was the best dessert ever. 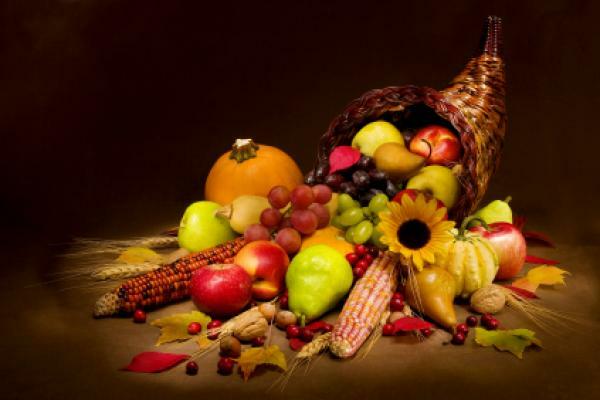 I hope your Thanksgiving nourished you as well – body and soul. We’re having 22 for dinner tomorrow, and everyone is contributing. In my house we’re responsible for turkey, ham, stuffing, gravy, and my incredible cranberry sauce. I added the zest of one orange to mine tonight and it is a really great balance of orange and cranberry. Not super tart, not overly sweet, just a really great mix. I may split the batch and add some fresh ginger to half just for a little more zing. We’ll see. I also made a huge batch of creamy mashed potatoes courtesy of The Pioneer Woman. Everyone is bringing something… we’ve got veggie dishes, sweet potato casserole, dinner rolls, mac and cheese, pies of every flavor, cake, deviled eggs, cheesecake, iced tea…. yeah, we are a family blessed with a bounty of food and love, and blessings. I plan on spending my day enjoying THEM. There will be no rushing out to stores, or being distracted by the dust bunnies that I will have inevitably missed. Tomorrow is a day to have my stomach and my SOUL filled with the gathering of family and friends. I am thankful for so very much this year. November has just sucked so far, but I am still here. I am still alive and kicking, and learning things about myself and my own resilience. I have a wonderful support system, and I plan to surround myself with them this weekend. Until then, enjoy what my stove looks like, as my root veggies are sauteed in preparation for tomorrow morning. They just LOOK like Autumn to me and the smell is something to be thankful for indeed. I hope tomorrow provides each of you plenty of reasons for gratitude and thanksgiving. Have a wonderful day, my foodie friends. When we lived our old neighborhood, Halloween night was always amazingly fun. We lived at the end of a cul-de-sac, and we’d hook up with the neighbors and do a potluck dinner out in our front yard. We’d set up tables, and everyone would contribute something. There was always chili, or soup, or beef stew… along with tons of other goodies. I’d make a crock pot full of my Kahlua Caramel Apple Cider, and as the sun set, we’d have a feast of fun, food, and fellowship. Our kids would take off in a pack to collect candy from all our neighbors, and we grown ups would set up with our candy, and the parade of princesses, superheroes, wildlife, and ghastly ghouls, would make one stop with all of us adults filling candy buckets and praising the costumes. Moving away from that neighborhood and to the end of our secluded dirt road was one of the hardest things I’ve ever done. So lately we’ve had another tradition that has sprung up on Halloween night. Spouse and I take the kids and we head over to a friends home for dinner and trick or treating. Debbie and Mike live in a neighborhood not too far from our old one, and for the past few years, we’ve hung out with them. The boys grab beers and shepherd the smaller kids for trick or treating while the women and older girls hang out on the porch, delighting in the hundreds of kids that come by. Tonight was no exception except Debbie said she would take care of dinner. I offered to bring something, but she said “Oh I’ll find something gluten free to throw together.” Debbie is a beautiful Italian woman, and I know better than to argue with her. We arrived tonight, jack-o-lantern and candy in tow… the boy was dressed as a Crash Test Dummy, and Mads was ketchup. I was delighted to find our friend Karen and her daughter were there too. Debbie had a super nice veggie tray, a pepperoni and cheese tray and some drinks all ready. She also had a big pot of chili on the stove, along with Fritos, sour cream, and cheese…and a gluten free cornbread fresh out of the oven. That cornbread was delicious too.. it was light, airy, and sweet with glutenous rice flour substituted in for the wheat flour. Karen had also chipped in and supplied a warm, cheesy, buffalo chicken mixture that was the centerpiece of wrapped sandwiches, made from super soft 100% corn tortillas and crisp romaine lettuce. My two girlfriends had put together a feast and I could eat every single thing! Now I have always seen my dietary issues as mine to deal with. I mean they’re my problem…I don’t expect others to do anything special to accommodate me. But to have my friends go to the lengths they did really touches my heart. What’s funny is that this morning, I woke up with the song “You’ve Got a Friend in Me” from Toy Story running through my head. It stayed there ALL DAY, so much so that I found myself humming it. I figured the universe was giving me a signal to be a friend, a blessing to others and I concentrated on being that person all day today. Then tonight, it seems I learned that being a blessing to others will often result in being blessed yourself. There’s a lesson in there my children… for all of us. Add all ingredients to crock pot and turn on. You want the cider to just warm through. Ladle into cups, and enjoy not only the juice but the apples as well. Don’t eat the cinnamon sticks though! The drink tastes like a delicious caramel apple, and is guaranteed to warm you all the way to your toes. Perfect for a chilly Halloween night, or equally as good when chilling out in front of a crackling fire. I have not done so great during this current Paleo challenge. Despite my good intentions, my life just has not allowed me time to put in the time and effort needed to cook meals that are 100% Paleo. I’m not eating horribly or anything, and I certainly haven’t been eating wheat (except those three bites of funnel cake which was SO not worth it). But going to the theater every day after work, and then going out with my castmates after shows means that some dairy, caffeine, sugar, and alcohol have made their way into my body. However, rather than feel guilty about it, I have accepted that this is just where my life is right now. I choose to take part in theater as my hobby. I choose to take time to go watch my kids play soccer. I choose to enjoy the social activities during this beautiful fall season. I don’t exactly CHOOSE to work full time, but I do enjoy the things my employment affords. You get what I’m saying right? It is what it is. As much as I love food, my life is about more than that right now. My activities are feeding other appetites now, I am feeding my soul and that is just as important. So maybe the point of this challenge, and the lesson to be learned is that doing my best is good enough. I want to have a happy, healthy relationship with food, not one that is obsessive and filled with guilt. My life is like a gemstone, colorful and multi-faceted, and I am just polishing each one – allowing them to shine and become more beautiful. Hope your Saturday sparkles too! 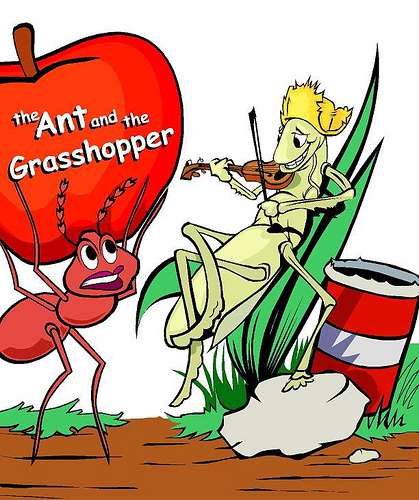 I think nearly every culture has a version of the story “The Grasshopper and the Ant.” You know the one, where the ant works through beautiful days putting up food, building a house, preparing for winter while the grasshopper plays the summer days away. When winter comes, only one insect is left warm, well-fed, and alive. Here’s a hint: It ain’t the grasshopper. Well I am obviously an ant. Today I bathed the two dogs; spread Borax on the floor and furniture to combat the fleas; roasted, shredded, and froze eight large spaghetti squash; peeled, wedged, and froze the last of the season’s fresh peaches in light syrup, roasted half of my stash of butternut squash, which I will freeze tomorrow (it’s in the fridge now), and loaded the dehydrator with poblano/ancho chiles that will dry overnight. Tomorrow I will put up the final bit of beans, and start harvesting the herbs in my herb garden. I think I will also make this: Butternut Squash and Apple Soup. I haven’t been able to get it out of my head since I first read the recipe. With any luck, I’ll have some other insect hanging out playing the fiddle while I cook. If I’m feeling sad, or depressed, or tired, or just kind of blah, the ONE FOOD that changes my attitude… without fail… is Nachos. It doesn’t have to be fancy, super loaded nachos either. I’m happy with corn tortilla chips and cheese. I think it’s the mixture of crispy crunchy salty, and creamy smooth cheese. Tonight I got home after getting my hair done, and I wasn’t feeling like cooking something new for dinner. However, I had some of that delicious chili made by my husband. I also had 100% corn tortilla chips, cheese, tomatoes, and sour cream. In no time, I had a plate full of chili cheese nachos, topped off with diced tomato and sour cream. And in no time, not only was my hunger satisfied… my soul was happy. Nachos really are a cheerful plate of fun. They are interactive, hands-on, and that mix of crunchy and melty never fails to make me sigh with pleasure. What is your favorite comfort food? Or more accurately, what food makes you feel happier/better, every time you eat it? What is this Paleo Challenge of which you speak? And ringing. OY the ringing! However, today I have had no fever, so I am getting better, albeit slowly. If the ears would open up, and if I could stay awake for more than 6 hours, I’d dance a jig (not for 6 hours straight, because then I’d really be tired). So I haven’t exactly been paying attention to food the past three days. I’ve barely gotten out of my bed due to this funk that I’m fighting off. I have relied upon my husband and children to bring me stuff to eat, and as long as it hasn’t been wheat, I’ve eaten it. Which means I’ve eaten ice cream, and chips and salsa, and french fries, and queso dip. OH! And Chipotle. Vegetarian Chipotle, because they forgot the chicken… but yeah. So not exactly the healthiest diet, but since I’m not really eating much, and I’m spending most of my energy drinking fluids, I don’t really care. So, coming up on September 17 (Stretch’s birthday!) there’s a new 30 Day Paleo Challenge being kicked off, and quite frankly, I CANNOT WAIT. I did a Paleo Challenge in January and honestly, I felt great. I kicked caffeine, I was sleeping better, I lost weight, my mood was elevated, and all that. So why did I quit? Well, I didn’t exactly QUIT, but I did expand my diet some to take in some of spring and summer’s best foods (hello, ice cream! ), and some indulgences of my own like Captain Morgan and Diet Coke (what? I’m only human). So while I didn’t abandon the plan, I definitely didn’t hold tight to the rules like I could have. Besides, I LIKE the challenge idea…I like a finite time frame just to see if I can do it. I like proving to myself what I can do. So starting on September 17th, I’m going to be proving it again. The challenge is being issued by the good folks at Lurong Living, in partnership with the oodles of CrossFit gyms across the nation. But since I’m a FOOD blogger and not a workout/sweat blogger (can you even IMAGINE?) I’m going to concentrate on the food and sleep part of the challenge. Ok, ok, try not to freak out at that last one. It’s THIRTY DAYS. You can do it for thirty days. You’ll also be required to get at least 8 hours of sleep a night. That means turn OFF the TV, the laptop, the smartphone… just turn it off and go to sleep. Give your body a chance to reset, recharge, renew… seriously, you’ll be amazed at how much better you feel. And if you can throw in a workout or twelve in that time, go for it! September 17 to November 18, 2012. Just do it. If you need help, there’s none better than Neely over at The Paleo Plan. Change your plate, change your plan, change your life. YOU can do it. Start planning NOW and be ready for action. Who’s with me? New Year, new resolve, and a NEW POST!